This is from an email she sent me. Link to petition below. Wow – what a year it’s been for healthy kids and families. We’ve called for —and won!—new healthy food guidelines for our littlest learners, calorie counts on restaurant menus, healthier drinks in restaurant kid meals, and much more. Well done! Never doubt that the voices of parents and community members like us can have a *huge* impact. But there’s more to do. Stopping the marketing of junk food to kids is high on our priority list for the coming year, and we need your help. Right now we have the opportunity to change the marketing practices of many of the biggest companies that are marketing food to our kids. * Join us to tell companies it’s time to follow expert recommendations around responsible food marketing to kids. What’s happening? Many big food and beverage companies participate in the Children’s Food and Beverage Advertising Initiative (CFBAI) and pledge to have healthier marketing practices. The CFBAI has made lots of progress in recent years, adding more member companies and adopting universal nutrition criteria for its members, including General Mills, Hershey, McDonalds, Coca Cola and more. This fall the CFBAI is updating its nutrition standards for food marketing to children. This is an important opening to ensure that these very big brands, which have extensive reach in our communities, are following the latest recommendations regarding what’s healthy for our kids. We’re asking the CFBAI to make sure only healthier foods and beverages are marketed to kids. * Will you join us? Add your voice now. Require that brands marketed to children only contain products that meet nutrition criteria. Encourage nutrient-rich foods, rather than fortification of otherwise unhealthy products. Remove sugary drinks from kids’ meals. These updates are backed up by experts and the new Recommendations for Responsible Food Marketing to Children report. If adopted by these major food and drink companies, they would be a great step forward in promoting the health of our kids. *Can you tell companies to do more to protect the health of our kids? It just takes a minute. Companies spend almost $2 billion per year marketing food and drinks to kids, and the majority of that marketing is for junk food. But companies can also be a part of what makes a healthy community, playing a role alongside schools, families, and public spaces. And we know they listen to parents. In fact, women make three-quarters of purchasing decisions so when we speak out, companies listen. After you sign on, please take a moment to post the above action link on Facebook, Tweet it out, and share via email. The more of us who take action, the bigger the impact we’ll have together. After all, our consumer power is nothing to sneeze at! Thank you. Together, we’re a powerful voice for healthy kids and families! P.S. If you signed a MomsRising petition around the CFBAI last year, please take a moment to sign again now! We have updated our petition to reflect the latest expert recommendations. Thank you! Recommendations for Responsible Food Marketing to Children, Healthy Eating Research. January 2015. Marketing Food to Children and Adolescents: A Review of Industry Expenditures, Activities, and Self-Regulation: A Report To Congress, Federal Trade Commission. July 2008. Like what we’re doing? Donate: We’re a bootstrap, low overhead, mom run organization. Your donations make the work of MomsRising.org possible–and we deeply appreciate your support. Every little bit counts. Donate today on our new, secure website. 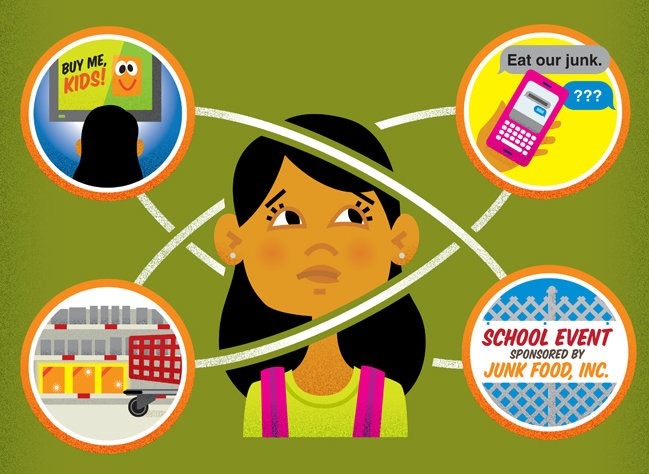 Companies spend almost $2 billion dollars per year marketing food and drinks to our kids. The Corporate Food and Beverage Advertising Initiative (CFBAI)—the industry’s self-regulatory body, which includes General Mills, Coca-Cola, Pepsico and more—is one mechanism for making it stop. Join us to ask the CFBAI to adopt expert recommendations to update marketing and nutrition standards for all of its member companies! This entry was posted on Saturday, September 24th, 2016 at 8:38 am	and is filed under Health Matters: Flashes & Reports. You can follow any responses to this entry through the RSS 2.0 feed. You can skip to the end and leave a response. Pinging is currently not allowed.